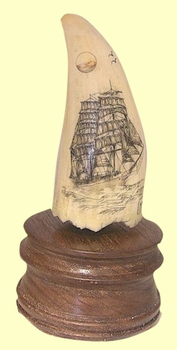 Home»Gallery of Legal and Registered Scrimshaw Whale's Teeth and Walrus Tusks»Gallery DisplayScrimshawSperm WhaleToothPortrait: "Bark S. C. Allen "
A portrait of the lovely and distinctive bark S. C. Allen is meticulously scrimshawed on the front surface of this classically-shaped right-handed Sperm Whale's tooth. This classic and wide Sperm Whale's Tooth measures 4 1/2 inches around the convex side from tip-to-base, is 2 inches wide at its base. Tooth on stand is 6 inches high. Not a lot is known about this graceful ship. The vessel, built at Bath, Maine and launched May 8, 1888, was 189 feet overall. Its beam was 37 feet, and depth of hold 14 feet. There were four double-berth staterooms, upholstered like the captain's cabin. The donkey engine and cookhouse were forward in the same house. In 1889, the new ship was carrying coals from Nedwcastle, New South Wales to America. She was moved to Oakland, CA. The city directory of 1895 shows her First Officer as George H. Johnson, of Oakland. Evidently, the S.C. Allen regularly used 'scabs' to 'shanghai' sailors to work aboard the ship; in June 1892, it was reported that Otto Anderson, a sailor and member of the Sailors' Union, was fatally stabbed by one of these scabs. His funeral sparked a protest movement by major local unions. In 1910, she lost her maintopmast in a squall in the straits heading for Port crescent, and put into Port Townsend. As a young man, Johnny Wilson, the first Democrat elected to Congress from Hawaii, tried to stow away aboard the S.C. Allen, but was discovered and send home. T. Thompson, San Francisco, master of bark S. C. Allen, was born in Norway in I853 and sailed out of San Francisco. He brought the Allen out from the East (Bath, Maine) and had been master of her since. Named after S.C. Allen, it was consigned to C. Brewer which put her in the sugar trade. The S. C. Allen was wrecked on October 13, 1913 off Diamond Head. All 13 crew escaped. A beautiful ship's portrait by a respected American scrimshander - A great gift for any discriminating collector. Includes a beautiful hand-turned walnut display stand, as shown. Stand allows for removal and replacement of the tooth for ease of viewing. This original piece is signed by American scrimshander M. M. Cohen. It is one-of-a-kind - Only one is available.